Yoga Bindu + Flax & Kale-double shot. 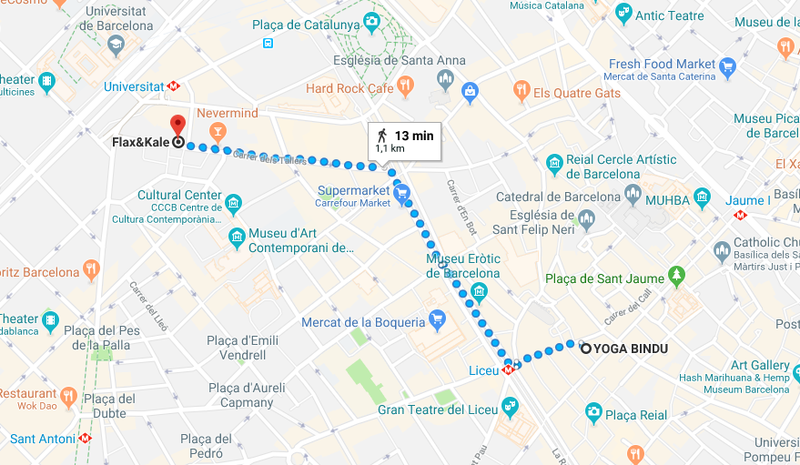 START: YOGA BINDU, Arco de Santa Eulalia, 1, 08002 Barcelona. FINISH: Flax&Kale, Carrer dels Tallers, 74b, 08001 Barcelona. THE WORKOUT: Saturday 11.30am for ninety minutes of multi-level flow with Xochitl. Meandering down the narrow streets in the Gothic quarter you could easily miss this absolute GEM. Yoga Bindu is tucked away up the stairs of an old building, with beautiful high ceilings and airy, light rooms where some intense asana takes place from some of the best teachers in town. Saturday’s multi-level flow class is a nice fusion between classic Ashtanga and flow and you’ll be feeling your internal fire going in no time. Sun salutations, standing flows, twists, challenging arm balances, seated flexibility drills (often working towards a peak posture) all integrate together in a hypnotic sequence. You can even hear the church bells as you do your downward dog. Xochitl has a beautiful vibe about him (as well as being able to perform the most insane yoga balances, he is a total #yogimaestro) and if you don’t speak Spanish (or Catalan for that matter) he will happily guide you with bits of English. If you’re a beginner this class is probably not for you, but there are other classes available on the timetable that are more beginner friendly. 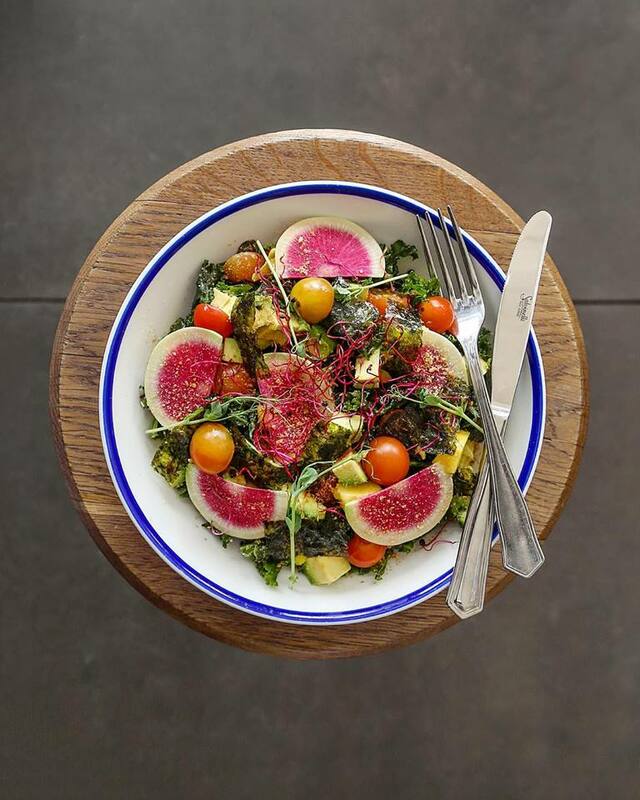 FOOD: Dubbed at the first-ever “Healthy Flexitarian Restaurant” in Barcelona, Flax & Kale is the city’s most hyped spot for health-conscious foodies and part of the Teresa Carles group. The majority of the menu is plant-based with bits of fish hear and there. Breakfast, lunch and dinner are served throughout the work week and then there is a special Weekend Brunch menu, which is what you’re here to try. Firstly there’s a whole section dedicated to avocado toast (we know). The classic avo toast with lemon and chia is a winner but makes more of a snack than a full meal. The Acai bowl has that thick smoothie texture and a sweetly sharp taste with a Brazil nut crumble that truly tastes like crack, its that good. “Teresa’s Favourite Kale Salad” is a purest dream; kale, tomato, seaweed, mango. We loved the “Carrot and Avocado Salad” with its creamy mashed tofu (tofu mató which literally translates as killed tofu) that had a similar taste to hummus. The savoury Mexican-style pancakes are also a winner. They are gluten free with red quinoa, sweetcorn, azuki beans, poached egg, avo, salsa and sour-cream loaded on top. There are also some seriously good plant-based burgers, and some spiralized sweet potato and courgetti pastas on the menu if none of that takes your fancy. Enjoy a fresh detox juice on the side or since its a Saturday a glass of cava. If your stomach still has room the orange cacao “Superfood protein ball” washes down with a coffee far too well. PRICE: For a first-time drop-in a class is €8. Regular class deals are also available; pay €50 and you get access to most classes a month. Special classes cost more at €13 for one, four special classes a month for €40 or eight for €60. 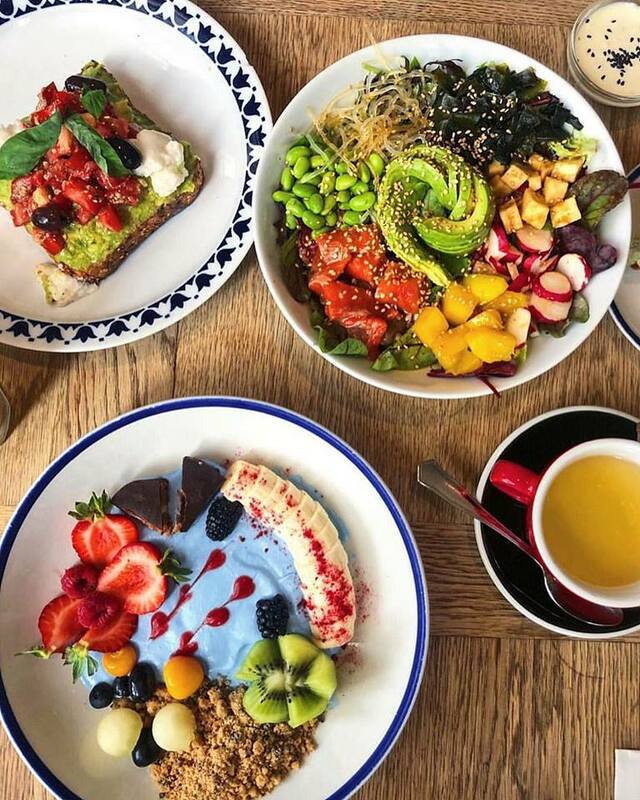 Flax & Kale’s prices are more on par with London than local; Classic avo toast is €4.95, Acai bowl is €8.95, “Teresa’s Favourite Kale Salad” is €10.95, “Savoury pancakes” €12.95 and “Superfood protein ball” €2. Cappuccino is €2.30 and all fresh juices are €5.95. BEST FOR: Craving a classic yoga weekend brunch combo.